One hundred years ago, on December 6, 1917, Finland became an independent state. The struggles for independence became energies directed at building the country, which now, one hundred years later, enjoys wealth, health, happiness and opportunity. As Finland commemorates this milestone with a “Finland 100 Years” year-long celebration of culture, it looks ahead to the future with both enthusiasm and trepidation. Each of us is asked to join in, and to respond to what it is like to be a Finn and how can we work together for the future. Son of Martin is built on both commonality and difference: the shared roots of our ancestry and traditions, and the differences of our lived experiences. Some of us have made a home on the other side of the world but continue to straddle the two cultures. How has this affected the family structure, what does it mean for the next generation, and how is this reflected in our work? That we have come together in work has made each of us reflect on how these ties can be binding in bringing us together and how they can stretch to allow freedom to be individual. As we launch Son of Martin in 2017 we respond, both collectively and individually, to the notion of “Working Together” by presenting objects and spaces of beauty and harmony. Son of Martin ROOTS/JUURET exhibition and launch: 17.6 – 16.7.2017 at Granary (Makasiini), Fiskars Village, Finland. 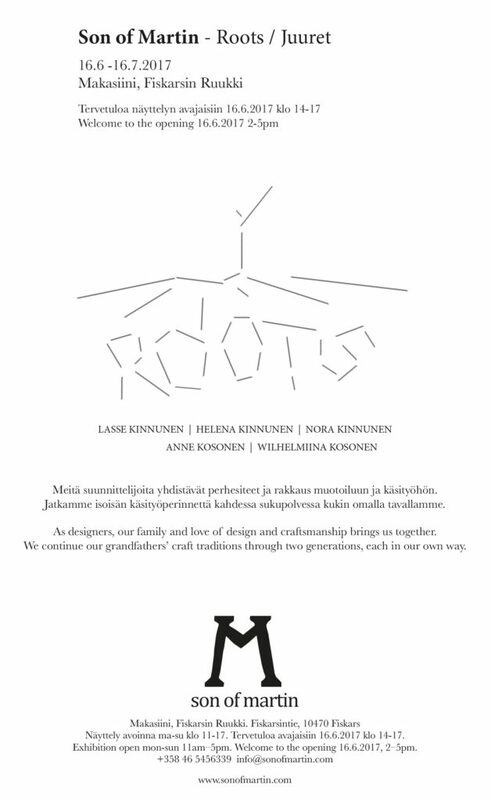 More information about “Finland 100 Years” celebrations here.